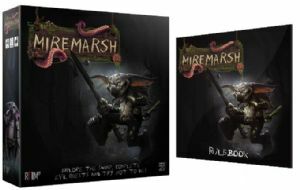 Kickstarter Edition, including stretch goals. Expected to arrive in August 2019 (Kickstarter Time). A game of evil deeds, death and tentacles! Starting from your home in the Warrens, you and your rival Bog Goblins set out to defeat a party of adventurers, slaughter a unicorn, steal a baby or do something equally evil to prove they are the best and become the Goblin King. However, the deadly swamp of Miremarsh stands in your way. This is your chance to slay the monsters, win glory, and try not to die. Again. Miremarsh is a 40-60 minute game of strategy, skill, resource management and card buying for 1-5 players aged 14+. Players collect equipment items, gold and old bones to buy pets, items or spells to defeat the monsters and overcome traps that stand in their way to the final quest. Each game starts with a set amount of goblins available to the players which they use up as they are eaten or killed by the denizens of the swamp. The player then re-emerges as a new goblin to continue the quest. Tiles are turned over and monsters, traps and gateways are unveiled allowing players to become more familiar with their environment as the game goes on. With some push your luck dice rolling as well as competitive horseplay the player who completes the final quest first is the winner.